Often confused with the similar-sounding Braggchurch Lodge, later known as Swiss Cottage, Bragg Church Cottage was a completely different building, albeit only a hundred yards or so separated the two. Bragg Church Cottage was accessed from Hendford by its own long drive and was situated in the middle of the Royal Nurseries on the southeastern side of Hendford Hill, approximately where the northern end of Southwoods lies today. The 1846 Tithe Apportionment noted that Frederick Greenham was the owner / occupier (although he actually lived at Hendford House) of Bragg Church Cottage & Orchard (Parcel 780). The Apportionment recorded that the parcel was primarily orchard and its area measured 1a 0r 10p (for details on historic land measurement - ie acres, roods and perches - click here). He was also the owner / occupier of adjacent Bragg Church (Parcel 779). 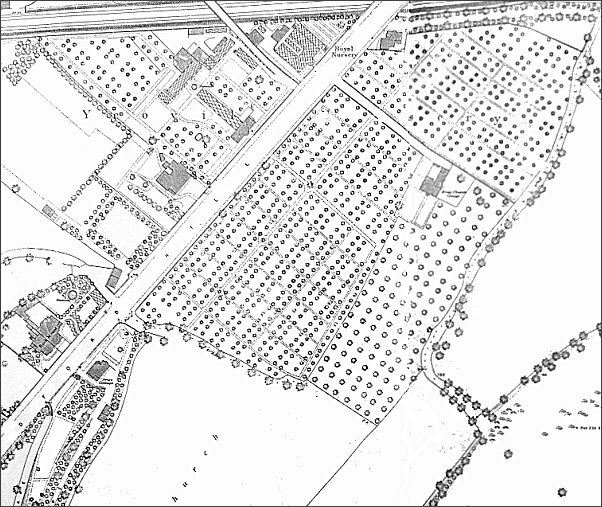 Map based on the 1886 Ordnance Survey showing Bragg Church Cottage right of centre and set in the middle of the Royal Nurseries, accessed by its own driveway. The similar-sounding Braggchurch Lodge, here shown by its other name of Swiss Cottage, is at lower left adjoining Hendford.